Atrial fibrillation (AF) places a massive burden on the healthcare resources of the United Kingdom as a major cause of stroke, heart failure and hospitalisation. Diagnosis is dependent on correct ECG interpretation and is relatively straightforward. If the QRS to QRS interval is irregularly irregular, it is likely you are looking at AF. If the baseline of the rhythm strip looks chaotic, with no organised consistent atrial activity visible, AF is confirmed. The pathophysiology underlying AF is complex, but essentially the arrhythmia is caused by multiple circuits of re-entry (‘feedback loops’) within the atria which lead to multiple foci of automatic depolarisation (competing waves), stimulating the atria to depolarise at very high rates – usually several hundred times per minute. The diagram shows these re-entry circuits, which depolarise the atria at very high rates, overwhelming the AV node, which only lets through a minority of the impulses it receives (due to its refractory time). 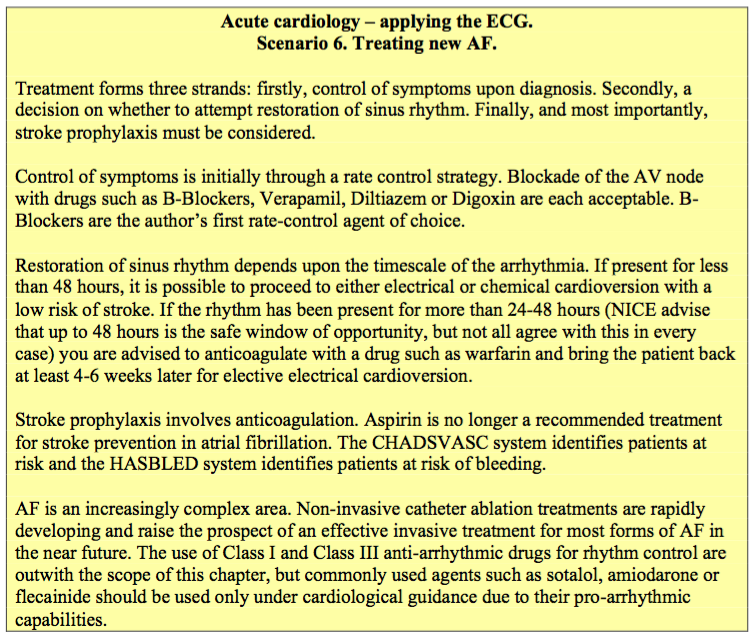 This is essential; otherwise, ventricular fibrillation would be induced. Accessory pathways without the long refractory times of the AV node can conduct AF at very high rates into the ventricle and cause sudden death. The baseline of an AF ECG may show very little in terms of fibrillation waves. This is sometimes referred to as fine AF. Alternatively, the baseline may appear to form p wave like structures at times – so called coarse AF - which reflect fewer circuits of re-entry. This can sometimes be mistaken for atrial flutter or sinus rhythm. Typical atrial flutter is caused by a re-entry circuit within the right atrium, which characteristically depolarises the atria at 300bpm. The refractory time of the AV node usually lets only one out of two of these beats through, and so the ventricular rate is characteristically 150bpm in most humans. This is due to the anatomical route formed by the depolarisation circuit with the right atrium, which is similar in everyone. 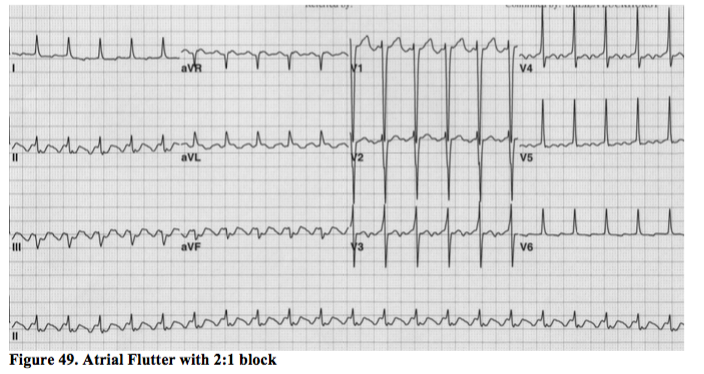 Atrial Flutter produces the characteristic ‘saw-toothed’ flutter baseline in lead II which is readily demonstrated through the administration of adenosine, which blocks all conduction through the AV node for a few seconds, allowing only atrial activity to be demonstrated. The flutter waves below have one large square between them, and are therefore conducting at 300bpm. Treatment is to lengthen the refractory time of (delay conduction through) the AV node using similar rate controlling agents as are used in AF, such as B-blockers. 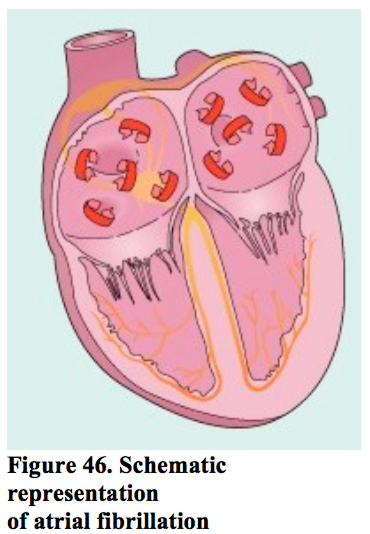 Atrial flutter has similar stroke risks to AF and the same guidelines for the use of anticoagulation and for considering cardioversion apply. This rhythm is especially sensitive to electrical cardioversion at relatively low energies. It is also highly amenable to curative treatment through elective catheter ablation, which should be considered in all subjects suffering recurrent symptoms and/or hospital admissions.